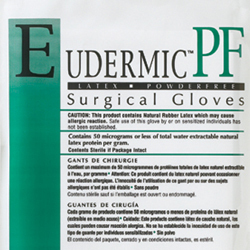 Medline's Eudermic™ PF latex surgical gloves are made to fit like a second skin for precise instrument handling as well as delicate procedures. The Eudermic surgical glove has a soft and gentle feel of natural rubber latex which provides excellent fit, strength and comfort. In addition, this latex surgical glove has an inner coating which eliminates the need for donning powder, which can be a potential irritant. The Eudermic has a brown color which reduces eyestrain in the O.R. by providing good contrast to light-colored organs.